Hello my stamping friends, and happy weekend! I have a little somethin', somethin' to share with you today, but I'm only giving you a little snippet. 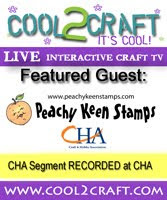 We're gearing up for a blog hop at Peachy Keen Stamps on Monday to celebrate the release of three new stamp sets, and this is what I've been up to with my new stamps. Be sure to check in tomorrow for a little more of what's going on here, and then on Monday for the full project and all the details. Thanks for stopping by today. Have a wonderful day, and enjoy your weekend! Happy stamping to ya! Oh I can't wait til Mon. to see all the new stamps. all these sneak peaks are killing me!! Hee Hee! Loving the tease Lorie!! Can't wait for the reveal tomorrow!